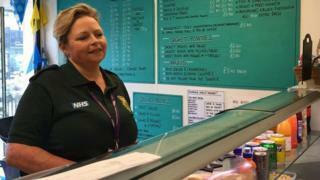 A campaign to allow emergency service workers to jump queues in cafes and takeaways has been started in North Yorkshire. The idea began when Gail Carpenter saw a paramedic wait in line in Ripon, only for the woman to be called to a job before she had bought her lunch. She wrote a post about it on Facebook, which was shared hundreds of times. As a result, some cafes in the town are now allowing on-duty blue light workers to have priority service. Mrs Carpenter said: "If they can fast-track the emergency services for their fast food they need their food to be fast. They are fast when we need them so we should repay them in kind. "The poor paramedic got bleeped before she got to the front of the queue and my daughter and I thought we would put it on social media and see how far it goes. We felt they should be automatically fast tracked." Many people agreed with the post, saying things like: "I really appreciate you for noticing that, Gail. It's so thoughtful of you! It happens to me all the time," from Kathy Myers. Jacqui Morrell added: "Having needed the emergency services myself two years ago, I have total respect for them and would fully endorse priority service for them." The appeal was picked up by Liz Guest who runs Big Bites in Ripon. She said: "I just completely understood what Gail said and I thought it's just something we can do and it's quite easy to do. They shouldn't have to go without breaks so if we can do something to help, we will." Paramedic Jacqui Pound, from Harrogate, was the one who sparked the campaign. She said: "I'm a bit overwhelmed. "It's brilliant that there is support out there. It would be great to be served a lot quicker so we can get back in our vehicles and move on and treat patients." Richard Bentley, a paramedic and member of Unison, added: "I think it is a really great gesture from Liz and Gail, the idea behind it is brilliant. My immediate concern was I don't want to feel a bit cheeky jumping the queue, but now I fully support it."